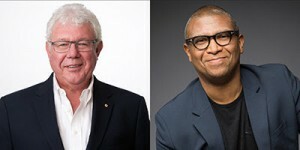 Emmy-winning live television producer David Hill and Oscar-nominated producer-director Reginald Hudlin will produce the 88th Oscars telecast, Academy President Cheryl Boone Isaacs announced yesterday. Though both have been in the industry for quite some time this will be the first time either of them have produced the Oscars. “We’re delighted to have this talented team on board,” said Boone Isaacs. “David is a true innovator with a dynamic personality. His vast experience as a live events producer, coupled with Reggie’s energy, creativity and talent as a filmmaker, is sure to make this year’s Oscar telecast a memorable one,” said Boone Isaacs. David Hill and Reginald Hudlin have been tapped to produce this year’s Oscars. Hill and Hudlin’s unique backgrounds will give the Oscars a new tone that and some fresh blood that the ceremony could use. Hudlin has been directing for more than 20 years and has done everything from the House Party to episodes of Modern Family. Last year, Hudlin produced the Academy’s 6th Annual Governors Awards ceremony and has been the executive producer of the NAACP Image Awards since 2012. On the flip-side, Hill has been an executive with the Fox group of companies for more than 25 years and most recently served as the senior executive vice president of 21st Century Fox, overseeing programming, digital initiatives, and other opportunities on five continents. The 88th Oscars will be held on Sunday, February 28, 2016, at the Dolby Theatre at Hollywood & Highland Center in Hollywood, and will be televised live by the ABC Television Network at 7 p.m. ET/4 p.m. PT.